Oh, my word this book was amazing! I don't read a lot of fantasy but if they are like this then maybe I need to change that. I liked how storms are something to be challenged and conquered in this that was a very interesting concept. I've never read anything like that before an I really dug it. 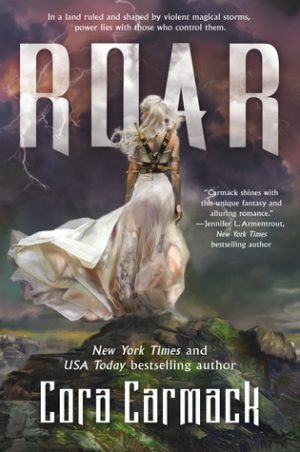 Roar was a strong enough character but she did drive me crazy sometimes. Locke was so sweet and cared for her a lot but she had such walls around herself. I knew and understood why and it made for a good book but I wished she wouldn't have pushed him away so much. Once she finally gave into her feelings were when things got really good. One thing that I was surprised about was the fact that her past was never brought up to the group. I was waiting for that bomb to go off but it never detonated. I guess I have that to look forward to in book two. Sly wasn't a big character but I didn't like the little I saw of her. Jinx, Bait, Ransom, and Duke were awesome characters and that type of people I would want to know in real life. They became a close-knit family and I was so glad that Roar chose to go with them. Another thing that bothered me was that Roar involved Nova with her escape. Making her life hell when the prince got his hands on Nova. I think she should have found out a way to escape without endangering her friend. I can't wait to see what happens in book two since Roar now knows what she is. I hope she can take down Cassius and get her kingdom back. I also hope she changes the laws now that she has lived with the hunters.